Welcome! 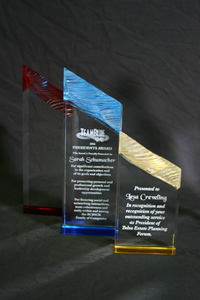 At Custom Craft Awards and Engraving we assist our clients in achieving their awards and recognition goals. We offer a variety of products including plaques, acrylic, corporate awards and gifts, crystal and glass, interior and exterior signage, golf and promotional items, trophies, medallions and ribbons. We also provide personalized or commercial in-house engraving, custom award and product design, screen printing, embroidery and artwork for company logos. RUSH SERVICE NO PROBLEM. At Custom Craft Awards and Engraving we value the opportunity to work with our customers. With over 20 years of industry experience, we provide only the highest quality products with superior customer service. Our friendly and professional staff is dedicated to fulfilling your awards and recognition needs.